Rich: What can I say about this week’s guest? She is to Instagram what Bob Ross is to painting, what Julia Child is to cooking, and what Morgan Freeman is to Penguin documentaries. She is a teacher, an expert, and a very dear friend. Whenever I have a question about Instagram I immediately turn to her. I’m very glad to have her back on the show for what, the 3rd, 4th, 5thtime, Sue B. Zimmerman. Sue B: Yeah, I think it’s a hatchet. Is that 4, 3? Rich: I don’t know, it’s been a lot. You’re my Ed McMahon. Alright, maybe not that. Sue B: I love that, I’ll take it. Rich: How many old people references did I just make? Sue B: Ok, c’mon, Julia Child? Seriously. Rich: So Sue, thank you so much for coming back on the show. As I mentioned to you, IGTV – Instagram Television – obviously launched. How long ago, a few months ago? Sue B: At least 2 months ago now. It was the beginning of the summer I want to say. Rich: Yeah, so it’s probably been about that long, Sue, because I remember when I started my trip for my sabbatical when I was planning it I was considering doing an IGTV every day just to kind of try out the platform. So that sounds about right. Now you’ve been playing around with it, what are your impressions of IGTV? Sue B: I played around with it when it first came out and then I got super intentional for strategies for business. So I can talk you and your listeners through the process of what I did and why I did it. And then I can talk about results and features, and I can talk about how it’s different than YouTube if you want. So you can take me down any path you want to go. But I have 15 videos here now on The Instagram Expert. It’s a process, I definitely am early frontier on all social media, so as soon as this was announced I grabbed my channel – #SueBIGTV – and I’ve been very strategic. I can walk you through what I’ve done and why I’ve done it. Rich: That sounds perfect. Absolutely. I figured this was just conversational. Even if I wasn’t recording this, I would just have the same conversation with you. Sue B: Totally. So what I like to say now about Instagram, is Instagram is a village. It’s a huge village with over a billion monthly active users. And now there are neighborhoods in this village and the neighborhoods are as follows. We have the feed. This is where you have that branded look and feel. I like to call it a digital magazine. Your bio is the cover, your feed is what’s inside. So you fulfill a promise you make in your bio in your feed. And the second neighborhood is my favorite, Instagram Stories, where you can broadcast every single day. You can share videos, you can share photos, and it’s a story you can tell every single day and have this ongoing channel of content. And then there’s the third neighborhood which is Instagram Live, which I do frequently and I just did one last night. But today we’re talking about the fourth neighborhood, which is IGTV. So this is essentially a TV program with an Instagram. I just love how it feels that way. As soon as you log on it feels like the TV is getting the reception in there. Like, go on the roof and fix the reception so we can watch it. So as soon as they announced it I got on and I was in the Boston Commons here in Boston, and I did from my personal account just to do it and see what it looked like. I had no idea what I was doing. And then I did one on my business account and that was pretty random as well. And then I did a second one that was a little bit more intentional storytelling at its finest and sharing exclusive content. Then I had a team meeting with my team and got very strategic in terms of if we’re going to try this out we need to put together a content calendar and we need to have categories that we’re going to test. So we had 7 or 8 different categories. One was “Ask Sue B”, one was using the question sticker on Instagram Stories and people could ask questions to me. We did some life casting about me, “A day in the life in Boston”, and “A day in the life on Cape Cod”, and what I do to set myself up for success as a business owner here in New England. Props to the New Englanders listening. And then I did some interview style. So I did side by side interviews with other people and we created these 7 different – I just mentioned a few, and there’s more, if you go watch my channel you’ll see them all – and what I’ve learned is that you can see your Insights, when you create an IGTV there are 3 little dots at the bottom, and if you tap them you can look at your Insights. You can look at your views, you can look at your comments, and you can look at the retention where people are dropping off. And what I discovered is that anything under 5 minutes is ideal. People just don’t have the time to watch long-winded IGTV unless it’s something pretty amazing and you’re getting their attention. So I would look at the retention rate pretty much averaging 17% retention. But here’s what I noticed, Rich. I am getting insane comments – real comments – the type of comments I get on my YouTube channel where people don’t just leave a quick post or leave 1-3 words that’s not that elaborate. But in IGTV for some reason, when people stop and watch your channel, and they can watch the next one and the next one, and they’re leaving comments and I’m giving strong calls to action. I’m saying things like, “Tell me the date that you’re watching this video”, because I’m tracking my data and I’m seeing that people are constantly leaving the date that they’re coming and watching it. And I’m getting great questions. You get these notifications on Instagram in the notification tab – which is your heart tab – so when people comment on your IGTV, you can get a notification. So I’m seeing that these are comments from people that are not necessarily already following me, these are random people finding me because they’re hanging out in the neighborhood called IGTV. And I say this because people have their favorite places where they like to hang out, and it’s not in the feed anymore. The feed is competing with all these other neighborhoods. So obviously engagement is down for all of us in the feed. But if you show up and stay top of mind in the other neighborhoods, you can still get that brand exposure and still attract those you want to be connected with. So I like to show up in all the neighborhoods consistently. And that’s the other word I want to say here. If you just kind of do random posting, you’re just going to get random results. So I can break down kind of what we’ve done beyond setting up that content calendar and schedule and attention to be more professional. Rich: I do want to talk about that, but before we do, I just want to ask some clarifying questions. So, when I first downloaded the IGTV app, it was definitely a separate app from Instagram. From a viewing standpoint, is it the same thing? Like, is it two different “neighborhoods”, is there really a wall between these two villages where I have to swap? Sue B: No. You don’t. It’s right within Instagram, everything is right within the app. They’re keeping you on Instagram and that’s their goal, to keep you on the app longer. Rich: As a viewer. But if you’re a producer you have to use the IGTV app to create new content? Sue B: No. To create new content, it’s vertical video and you can create content and save it to your camera roll. This is not a live broadcast. This is something that you can think about, which I do and I want to make sure that everybody always walks away learning something from me. I’m not here for kicks and giggles. It’s always a business lesson that I’m giving whether it’s Instagram related – or in my channel it’s more business related – but I make sure that that content in IGTV is exclusive. Meaning I am not repurposing my YouTube videos, I am not repurposing a video I did on my Facebook. I am taking the time to be intentional and what is organic to that platform. I want people that are going there to feel like they are getting something they wouldn’t necessarily get somewhere else. So to answer your question, its vertical video that you save to your camera and you can upload it whenever you’re ready. Rich: Ok. But you can do that through the original Instagram app, or you need to use the IGTV app? Sue B: You create the video on your phone or from some fancy schmancy camera – I use my iPhone – and I keep everything simple. I do it from my iPhone and I save it to my camera roll. And then we edit. And I’ll tell you the step by step of what we do to produce that, actually, once you understand this. Are you good here? Sue B: Cool. So after we have that content, there’s a couple other steps. We create a cover image for the video. So I just use Instagram Stories to do that, nothing fancy here. I make sure I take a photo and I use the text that Instagram provides for different text styles. I use the same color every time for brand consistency. I have a title for that IGTV, I @ mention Sue B Zimmerman so you know that I’m the creator, and I use my hashtag #suebigtv. I do all of that so that when you see that cover there’s that branding. So we’ve got branding on the cover, and we also added a clip at the very end of my video that has a little music and it says “suebzimmerman.com”. So at the end of my video I’m driving traffic or at least you’re seeing my website. So that’s done from someone on my team bringing together a couple different pieces. If the video for IGTV needs to be edited, it’s done from one of my team members and it’s done in iMovie. Rich: iMovie on your phone? Is that what you’re saying? Sue B: I don’t so it on my phone, she probably does it on her desktop. Rich: Ok. I do know they have iMovie on the phone, I just was curious to know. Sue B: Yeah, I do know some people that are like ninjas at that. I need to learn how to clip it and add it, but there’s all sorts of app for videos where you can just add clips. But I did string together, if you watch my videos Rich you’ll see there’s all different styles of how I did my IGTV, because we were really trying to track which ones got the most engagement. Like what style video, because I can go in so many different directions and we wanted to deliver what the audience wanted. So that is essentially how we create the branded look and feel of the IGTV. Now talking about The Instagram Expert, if you guys go look at that you’ll see exactly what I’m talking about. In addition to the cover and creating the video, there are things that you can do for your business that are branded as well. You can create a title for your video, and you can also write a description. And the cool thing about writing a description is that @ mentions are live, hashtags are live, and links are live. And you don’t have to have 10,000 followers to add these elements to your description. So a lot of people don’t even know where the descriptions are, which is annoying. So if you go look at one of my videos, on the top right there’s a tiny little arrow next to my name. And when you tap on that white arrow, that pulls down the title and the description. So Instagram doesn’t make it super easy for people to see all of the SEO aspects that exist within the title and the description, which is a little bit of a problem. So there’s that. Any questions with this, Rich? Rich: No, it makes sense. I think if you’re listening at home or not driving, you should totally pull up the Instagram app so you can follow along with Sue. And of course we’ll have links to all this stuff in the show notes. But no, Sue, keep going. Sue B: Ok, so here’s what I want to tell you, I’m going to give you links to each of my IGTV videos. So this is the most exciting thing, each video has its own unique link. So if you’re going to go through the effort of creating content for your IGTV channel, you can repurpose those. Meaning you could create the link – and you could even create a custom link – and you can tweak that video and drive traffic back to your IGTV. So I always like to say “cross pollinate” on the internet, but don’t make things too hard. So I’m driving traffic back to my IGTV channel. You can post it to Facebook and you can say what you talked about and why people should actually go check it out. So if you’re looking to drive traffic back to IGTV and eventually back to Instagram, because if they love your content and your channel most likely they’re going to click in and check out your account as well. Does this make sense? Rich: It absolutely does. I also notice as I’m looking at these videos that you have subtitles, or captions, on your videos. Sue B: Yeah. That would be another thing we can talk about. My husband – Roger Zimmerman – who’s in one of my IGTV channels to talk about voice captioning. Rich: I think I actually saw that episode, organically I watched that episode. Sue B: So Roger came into the video and he did a great job explaining the power of captions for videos. So 3Play Media here in Boston transcribes all my videos and we have a system where I basically upload the video and then they transcribe it and we burn in the captions. Because here’s the thing, Rich, people who are watching video on their phone often are doing it when they’re on a train, in class, when they’re not supposed to be, and they can’t turn up the volume. So you have to have those captions, and that’s for the accessibility. So that’s another added value for the hearing impaired as well. So we’ve added captions and that’s been very exciting and people have appreciated that as well. Sue B: Yeah. So if you want to look at some of those links…I wonder if you can grab the link or if I’m the only one that can grab the link. Are you on my account right now? Sue B: So at the bottom if you tap on the… oh you probably can’t tap on the 3 dots, I think only I can. Rich: Oh no, it’s says “copy link”. But you know, why don’t you give us after the show, send over some of the best links that you want people to check out, and we’ll absolutely share those in the show notes. Sue B: Well here’s what I’m going to tell you, Rich, look at the ones that have gotten the most views and the most comments, and those are the ones that you should share. And I’ll share my top 3 or top 4. That’s the best way, obviously. Let the audience pick. So one of them has almost 4,000 views, which is a lot. More views than Facebook or my Instagram feed. So there’s all that. Also, a search within IGTV where you can search user’s user names and find accounts. And now IGTV this week – at least to my knowledge and observation – Instagram is pushing in my newsfeed IGTV videos from people that I follow that I might be interested in watching that they’ve already published, and when someone is uploading a new IGTV, I just shared it with my team in Slack. I took a screenshot – and I’ll send that to you as well – Instagram is showing when someone is doing an IGTV. So they’re trying to push people to watch IGTV from the newsfeed based on who you are following. Rich: So they’re all in on this. Sue B: Well I think so. I mean, I’m not all in on it completely. Meaning I’m creating weekly content, my team and I decided to kind of back out of having too many hands on it – meaning editing the video and spending a lot of time with my team – so I’m taking on IGTV solo and I’m going to find an app to add the clip at the end. But I’m doing selfie-style videos teaching lessons. So I just did one talking about my travel tips, I did an interview with Jay Z who you know, I’m covering from when I was in Colorado for Viveka von Rosen’s wedding. And I’m like, “Jim, jump in now and tell us what you’re doing for work now, you used to work with me and now you’re off doing this”. So I’m doing the interview style, but everything is selfie-style, because the videos that you’re going to see in my IGTV channel are teaching you from the computer via Reflector and ScreenFlow. And the transcription on those don’t work quite as well because they’re not lined up and centered, and I think the selfie-style ones are just better than the how-to. So again, you don’t know until you try. So I tried everything – this is how you learn, you guys – in terms of what would your audience want to learn from you. What are the things that you can teach them, not just in the niche that you’re in, but in life lessons and business that you have had. And so for me that’s a lot because I’ve been an entrepreneur for so long I have a lot of lessons that I can teach. And that’s why we decided to create these buckets and test the content. Rich: And so how are you measuring your success? It sounds like you said you’re not all in, or your teams not all in on this, and you’re kind of going to go and try this. Sue B: Yeah, here’s why. So in each video I put a link “suebzimmerman.com/igtv”, that’s our lead magnet. And we’re not getting clicks to that, so we’re tracking as we do everywhere on the internet, all of our UTNs, all of our custom links for our lead magnet and we’re not getting opt in, we’re not getting people opting into our email list from IGTV. However, I don’t think that’s a complete wash, and that’s why I’m not ditching IGTV, because I am getting insane comments from people saying, “Oh my god, I love your energy. I love the way you teach Instagram. I need to follow you here, I’ve been watching you for an hour”, and I’m like, ok, cool. They are slowly coming over to me, finding me, I am creating relationships with them, and over time they will inevitably sign up for my email list and ultimately purchase something from me. It just might take a little bit longer than the normal “conversion”. And I hate that word. Rich: So IGTV so far for you so far has been very top of funnel, so to speak. Sue B: Yeah. I mean, I like to think of it as another place where people can get to know me and trust me. Because here’s the thing, if you are in business you have to show up relentlessly as that go to person that you say you are on the internet. Otherwise, no one is going to believe you. And I think Seth Godin said it best, you have to do at least 10,000 hours to become the expert at what you do. Well I’m in it for at least 20 if not 30 thousand hours. I count how many hours I teach Instagram. So I just think this is another place where I can touch someone who likes to consume video content outside of YouTube. Right? Rich: Right. So I’m obviously playing around with your IGTV channel while we’re talking, and I did click on one of the links, and not everyone you had necessarily had a URL, and I think I just looked at one that didn’t. So this is one nice feature. Sue B: Well I was going to say that became one of our intentions if we’re going to go through this work, we need to put a link to drive traffic somewhere. And I could go back and edit those – and I should – because you can edit your IGTV on desktop if you have a map. A lot of people don’t know that. There’s three little dots at the bottom right when you login to your Instagram account. So if you’re on the desktop and you go to Instagram.com, there is an IGTV icon that you can tap into underneath and you can go to your account, and then there’s three little dots on the right where you can edit your description. So if you spelled a word wrong or you forgot to put in hashtags or forgot to put in a link, you can go back and you can edit those which is just really cool. Rich: That is very cool. So what are some of the lessons you’ve learned from your brief couple months here on IGTV? Is it worth it, is it something that’s for someone like you that’s kind of an Instagram expert or social media star? Do you see a place for it for somebody who’s doing other types of Instagram marketing or maybe has a brick and mortar type store? Sue B: Great question. It is not good for you if you are not comfortable on video. First of all, it’s not where I’d say to start. If you’re new to Instagram and you have under 1,000 followers, or if you’re not making any money yet, suebzimmerman.com/guide. That’s where you need to go to download my 12 pages of how to get going and start in on Instagram. It’s not going to be start on IGTV, it doesn’t make sense to add IGTV. Here’s who I think it’s best for. If you’re someone itching to do a YouTube channel that you just can’t wrap your brains around all the things that you need to do to do a YouTube channel really well, then this is a good place to have videos that live on, that have a link you could share to show that you are that go to educator or influencer. So it’s a good place to start. Now I have the YouTube channel and YouTube for us, we get so many leads and so many people discover me just from searching because it’s owned by Google and YouTube is amazing. So I don’t even want to compare this to YouTube but I’m just saying to those of you that are looking to create more content that builds authority and you love Instagram and you’re all in on Instagram and you’re loving this idea about having a presence in each of the neighborhoods, then this is a good strategy for you. But it’s not where I suggest people would start. Rich: Alright. This has been great, Sue. I know there’s so much more to learn about IGTV and Instagram. Where do you want people to go to learn more form you about how they can leverage the power of Instagram? Sue B: Like I just said, that guide – suebzimmerman.com/guide – I invite you all to grab that. And if I’m in your ears right now and you’re jogging, or driving, or raking, or shoveling, or cooking, I would love for you to come on over to The Instagram Expert and say hello in the comments. Say hello in the comments and tag @therichbrooks, so Rich gets a notification that you actually did the work, and your hashtag #actiontaker, because I’m all about the action takers. And that way both Rich and I will know that you have listened, and more importantly, we want you to tell us what you’ve enjoyed hearing or learning the most, or if you have a follow up question then ask it in the comments. Here’s the thing I want to say to everyone, people struggle with posting on Instagram. They struggle with having consistent content, they struggle with their graphics, they struggle with their photos, and they just generally struggle. And I say to those that want to be on Instagram and have a mediocre feed but really want to have a community or talk to people, hang out in comment threads with people you admire, people you trust, and have a conversation be a part of the community and the conversation thread. Because those comments stay on forever and you can meet and connect with people simply from showing up. And honestly, showing appreciation. I always say if you consumed product in any regards – like this podcast – make sure that you give Rich a 5-star rating and subscribe to his channel and let him know that you’re getting something from being here. So I preach this all the time. What do you think, Rich, do you like it? Rich: I think it’s wonderful, I just want people to know I did not pay you for this, that you are just a sweet and kind person. Rich: Sue, it is always a pleasure to have you on the show and I always learn not just one, but about 27 new things. So thanks so much for stopping by today, I really appreciate it. Sue B: It’s always a pleasure, anytime Rich, take care. 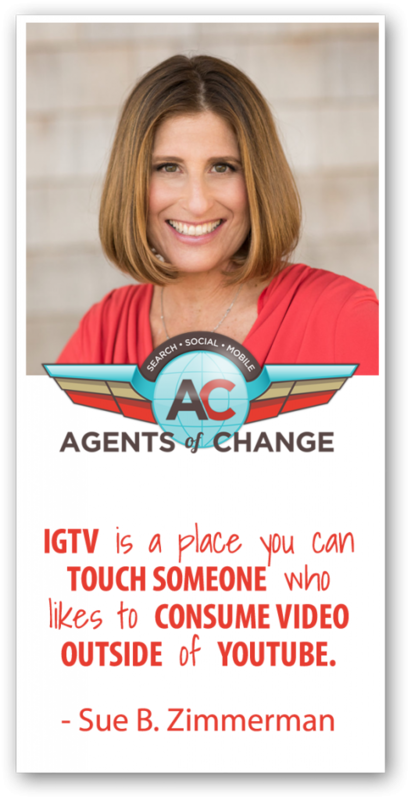 As The Instagram Expert, leave it to Sue B. Zimmerman to put together a 12-page guide on how to navigate Instagram’s newest feature, IGTV. And be sure to head on over to her Instagram page for her knowledge of all things Insta. Rich Brooks is the President of flyte new media, a web design & digital marketing agency in Portland, Maine. He knows a thing or two about helping businesses grow by reaching their ideal customers, and to prove that, he puts on a yearly conference to inspire small businesses to achieve big success. You can also head on over to Twitter to check him out, and he has added “author” to his resume with his book!